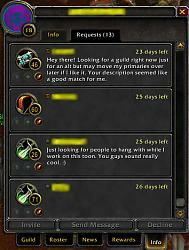 GAOA alerts the user to when a guild applicant is online through status messages posted in chat. The "Requests" tab in the default GuildUI is also updated to reflect the number of online applicants and status icons are added next to each applicant to show their online status. For consistency, the status icons are the same used by the default Friend List. A grey dot means offline, a green dot means online, and the away mark (orange timeclock) means their status is being checked. -There have been reports of "player not currently playing" messages randomly sneaking past the error trap meant to detect and use these messages for determining online status. It's a side effect of the unique way this addon detects whether a player is online without them running a copy of it. It sends a whisper through the addon channel and listens for the chat server to respond with that exact error. It uses the default UI's message filter system to trap these errors and prevent the chatframes from displaying them. If the server hasn't responded with the error within the timeout period, the addon assumes the player is actually online. I'll see what I can do, but a fix to this problem would require compliance with the author of Broker: Chat Alerts, mainly running through the table of filter functions returned by ChatFrame_GetMessageEventFilters(event). I have observed a bug that happens when you zone, reload the UI, or are experiencing large amounts of network lag where a series of online followed by offline messages briefly flood chat. Every method I've tried to suppress these messages had failed and has postponed the next update until I can figure it out. 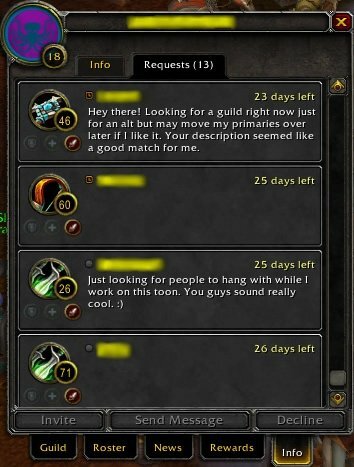 I've seen it happen rarely since the 4.3 patch even with the addon inactive due to insufficient permissions (you need to be able to invite someone to the guild to be able to view the applicants). No errors yet when loading out of date. I have a newer version in development, so the ToC will be updated when I get to finishing it. WOrks well, only 2 toons to try it on so far and worked like a charm.